HUMBOLDT COUNTY, Calif. - Bekah M., or Rebekah Martinez, may be one of this season's most talked-about "Bachelor" contestants, but her mother may not have known that she was going to participate in the ABC reality show. 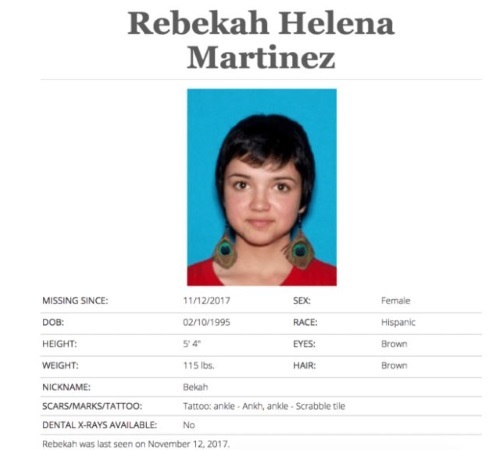 On Nov 18, 2017, Martinez's mother called the Humboldt County Sheriff’s Office in California to issue a missing persons report for the 22-year-old, saying she hadn't had contact with her daughter since Nov. 12. Martinez had allegedly told her mother that she was going to work on a marijuana farm and would see her in seven to eight days, but never followed up, nor did she respond to deputies' attempts to contact her. Although Martinez later reconnected with her mother in November, authorities explained, it wasn't until Feb. 1 that she made contact with a deputy and thus was removed from the Missing and Unidentified Persons System. “As part of procedure, Humboldt County Sheriff’s Office deputies are typically required to make direct contact with the missing person to confirm status and well-being, as geographical and other factors allow,” the sheriff’s office said in a statement. "Based on the totality of information provided regarding Martinez’s well-being, Martinez status as a missing person was cleared over the phone." Though it is unclear when Martinez began shooting "The Bachelor," she wrote on Instagram Sept. 17 that she was "giving up my phone and social media for the next several weeks." She did not post another photo until Nov. 22.